The winter of 2013/14 brought icy temperatures and masses of snow to the South Caucasus. The snow was up to a metre deep in places and in higher parts where the wind blows faster, snow cover reached up to three metres. The temperature in the CWR plummeted to -27 degrees centigrade, which was much more severe than expected. Some parts of the CWR were inaccessible either by car or on horseback. As it was foggy all around it was also difficult to observe the animals in the area. However there were regular sightings of Bezoar Goats. Whereas a year ago, in 2012, we would record 23 individuals at the most in one herd during the mating season, by the end of November 2013 we had already observed a herd of 40 individuals headed by a huge Bezoar buck. 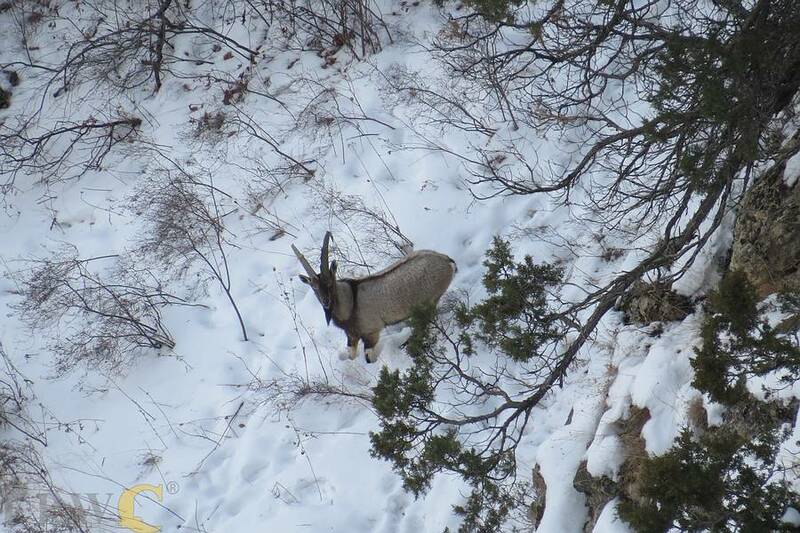 Bezoar Goats can now be seen just 500-1,500 metres from the ranger station. They are now bold enough to come down to the river to drink water and even come close to the Urtsadzor Eco-Training Centre. We now see Bezoar Goats gather for grazing mainly in the early mornings or evenings at Dahnak and Khosrovasar mountains. The sightings of male Bezoars became increasingly regular during the year, and it is likely that there will be competition among the males. Wolf sightings also become regular, one of them even attacked a domestic animal in the village. Another surprise was waiting for us early in January: an attack of hungry hares. I do not remember myself encountering hares so close to the rangers station in winter. It seems they were attracted by the new saplings as there are no other young trees in the territory. To address this problem, we took immediate an action and protected the trees with tree guards. A fox, one of the hare’s natural predators has also been spotted close to the ranger station so perhaps there will be a natural solution to the threat to our trees. During the winter we didn’t have any sighting of the Caucasian Leopard, although a camera-trap recorded a leopard on 8 November. With the spring approaching we hope that we’ll be able to record our leopard safe and sound. Among the birds sighted in the reporting period were Bearded Vulture (Gypaetus barbatus), Golden Eagle (Aquila chrysaetos), Griffon Vultures (Gyps fulvus), Cinereous Vultures (Aegypius monachus) and many Chukar Partridge (Alectoris chukar). There were also sightings of Grey Partridges (Perdix perdix).